Since I received my Kruve, I never gotten the chance to test it with Espresso so last week I decided to give it a shot and see what I can do with it. I started by using the 300 and 600 micron sieves and 34.5gm of coffee from the Super Jolly, which is almost two times my usual dose of 17.5gm. After I shook the Kruve for a minute or so the yield in the middle tray was almost 21.5gm so I lost 13gm between the boulders and fines. I chose to only use my usual dose of 17.5gm and the results were underwhelming. The shot was too fast and somehow way too bitter. The bitterness can be caused by the coffee lacking the boulders and fines but the water temperature could have been higher than usual as well. This week, I decided to try the experiment again but this time move the adjustment collar/ring on the Super Jolly couple of notches finer. By doing so, I was hoping to create a finer grind to slow the flow while keeping the dose the same at 17.5gm give or take 0.1 or 0.2gm. After shaking the Kruve for a minute or so, the result was 24.1gm, so I lost a little more than 10gm, which is better than last week when I lost 13gm. This can be attributed to the grinder being more consistent as the grind gets finer or maybe I shook the Kruve harder last week compared to this week. To stay consistent, I kept the dose to my usual, which is 17.5gm and pulled a shot. The shot was on the slow side but the taste was much more balanced. Still, bitterness was a little higher than I’d prefer but there was absolutely no sourness whatsoever. Personally, I’m not a big fan of sourness in coffee, or anywhere really so this shot was a really good one to my taste. Next week, I will go only one notch finer instead of 2 notches like I did today and do the same test again and see how the shot will taste. Stay tuned! For this Saturday my wife and I decided to go to Lancaster to tour the Amish Village and explore the area. Since I’m always on the lookout for good espresso, I used Google Maps to search for espresso bars and local roasters in Lancaster and found a few but one stood out for me and that is Aura Espresso. Later on in the post I will explain why the place stood out and describe my experience. At 7 am, I got out of bed and first thing I did was go to my espresso station and prepare my latte. My Nuova Simonelli Musica is plugged to a TP-Link Smart Plug WiFi timer that ensures the machine is on on weekends at 6 am so by the time I’m up at 7 am, the machine is all warmed up and ready to go. After I prepared my latte I sat down to read the August edition of Barista Magazine and enjoy my morning cup. Around 8 am and after I was done with my latte, I started preparing a V60 for myself and my wife (the latte is just a warmup). After we enjoyed our morning drip, we started to get ready to leave the house and by 9.45 am we were already on the highway heading to Lancaster. Before arriving to Lancaster, we decided to grab a quick lunch as we were both starving and after a delicious lunch at Cracker Barrel, we resumed our trip to the Amish Village. Finding the Village was pretty easy with huge building pointing where the village is. We parked the car and lined up to buy the tickets for the tour. The ticket office is located inside the gift shop, which is located inside of an actual Amish house where an Amish family used to live back in the 70s. After we purchased the tickets, we were led to a small room (what used to be a functional living room for an Amish family) to listen to a quick introduction of the Amish, their homes and their lifestyle. After the very informative intro, our tour guide walked us through and explained the different parts of the house and how the Amish lived in it. The tour ended outside the house after we were shown the summer kitchen and were told to roam around the village to explore. The Amish can use appliances but won’t power them using electricity, instead they rely on other sources of energy such as propane, air compression, solar power, etc. Washing machine, especially made by MAYTAG for Amish use! Different carts for different purposes such as transportation and farming. After the tour was over, we drove and got lost (on purpose) in the backroads to enjoy and admire the Amish’s farms and vast green and beautiful lands. After that was done, it was time for Aura Espresso. Aura Espresso initially grabbed my attention because they serve and sell Lavazza coffee. For those of you who know me or follow me on Instagram (if you aren’t, you should) know how much I love Italian coffee and specifically Lavazza. My favorite two blends are Lavazza Top Class and Super Crema. Both blends are not sophisticated but are excellent choices for milk drinks and even for straight espresso if you’re like me and don’t like the lighter roast specialty coffees with the fruity, bright and acidic notes/taste. Earlier in the week, I decided to reach to Aura Espresso through Facebook Messenger and let them know that I’m coming and also ask for their permission to photograph the place. It’s one thing to take few pictures with your cellphone and it’s another when you show up with a professional camera and start taking pictures like if you’re the Paparazzi. The response I received was very gracious and was told by George (one of two owners) that I’m more than welcome to stop by and photograph all I want. Upon our arrival, we were received by Tina who introduced herself to us as George’s business partner. Beautiful espresso cup outside the café. There is also a window overlooking the street to order drinks without going inside the café, excellent idea for morning commuters. As soon as you enter the café, you are greeted by an Aura Espresso Room sign and a beautiful decor, incorporating two of my favorite colors, white and blue, giving the place a cozy and calming ambience while at the same time serving as a perfect match to the logo and the brand image of Lavazza. After a small conversation with George and Tina, I learned that they are both from Greece, which explained their color choices for the place (white and blue). Nuova Simonelli is one of my favorite espresso machine brands (I’m biased since I own a Musica). 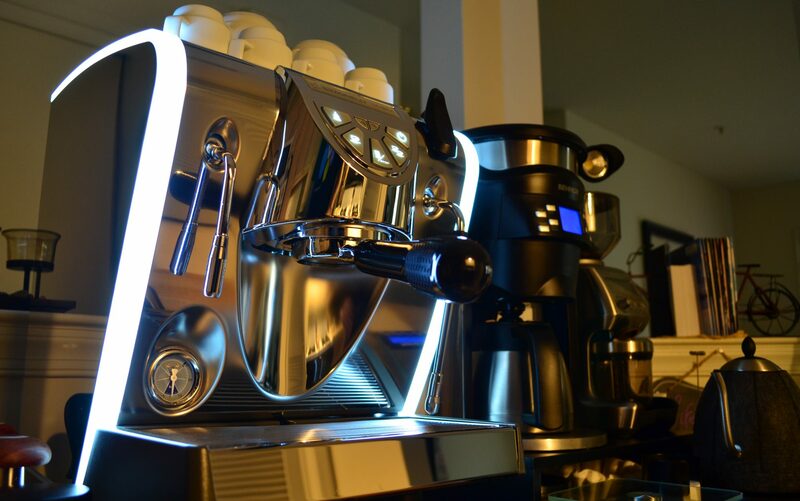 Aura Espresso uses an Aurelia 2 (2 groups) espresso machine. More coffee bags for sale and all displayed in an attractive way. Nicely done. Looking around in the café, I noticed a sign explaining what the word “Aura” means, which I thought was smart and it shows that a lot of thought was put in the name and it wasn’t just picked cause of a cool factor or by a marketing company. After I was done looking around, I ordered a small latte and my wife ordered an Americano, both were delicious and served with fresh thin waffle cookies, a perfect complement to the coffee. George explained that the cookies can be eaten as is or can be placed on top of the coffee mug to heat up and become softer. Either way, it tasted delicious. Being the gracious hosts they are, George and Tina offered us an apple cinnamon muffin and made us their signature Aura Espresso drink called Freddo Cappuccino. The Freddo Cappuccino is made of 2 shots of espresso, frothed milk and Aura’s secret syrup. George adds a nice touch by etching some art on top using chocolate syrup. The art doesn’t affect the taste but it shows that he cares and loves what he does. All three drinks, waffle cookies and muffin were so delicious that this is how the table looked like 15 minutes in and my wife loved the muffin so much she took what’s left of it with her. If I’m back in Lancaster, I would definitely come back to Aura Espresso for a latte and a Freddo Cappuccino. The place and drinks are everything a coffee aficionado can ask for. Delicious coffee made by an excellent barista and unbeatable service, all in a gorgeous and clean ambience. Can’t beat it!